Jim Waters 601XL-B project, “In The Arena,” Memorial Day 2013. We had a visit from well-known and liked Corvair builder Jim Waters. 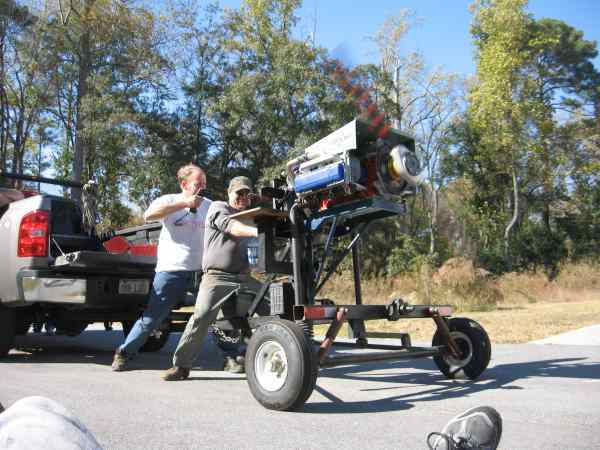 He is from Pennsylvania, but he drove down to Florida with a trailer to pick up a nearly done 601XL-B that he found for sale on Barnstormers.com. Jim has a Fisher Horizon project in his shop, but he has been reading about the adventures of 601/Corvair pilots like Lynn Dingfelder, Ron Lendon and Phil Maxson, and he decided to change gears a bit and put his complete, test run 2700/Weseman bearing engine on the more versatile 601 airframe. When this one came up for sale, he saw his chance, made the move and got his own aviation adventure into high gear. Above: Jim, his girlfriend Suzi-Q, Grace and Scoob E do the “looking skyward” pose in our back yard. The airframe is a Zenith quick build kit, with a panel in it, instrumented by the original owner for a Corvair. 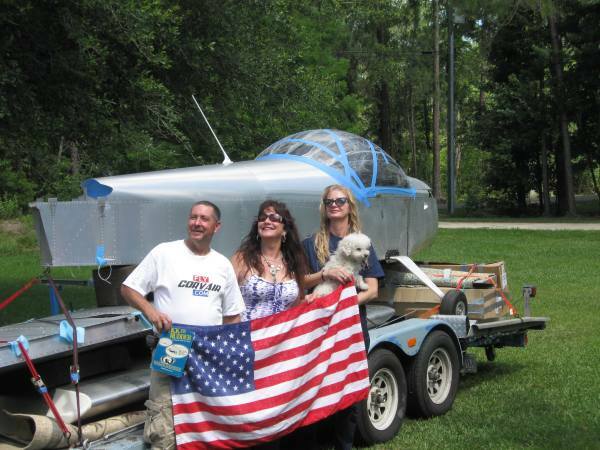 Jim and Suzi spent the night at our place and picked up most of the parts to install Jim’s Corvair on the front of this plane, including a powdercoated motor mount. This plane could easily be flyable by the end of the summer with just part-time work. Getting an aircraft this complete does not present any 51% rule issues. As long as 51% of the work in the plane was done by non-paid builders, it does not matter how many of them worked on it. A plane can have 11 different owners who each do 5% of it, and it will not have any issue qualifying as a homebuilt. Note that Jim has a copy of Stick and Rudder in his hand. It is a good luck present from Grace and I at the beginning of his new adventure. In looking at our Web site, I was reminded how many Colleges and airshows Jim has made it to, and how he has always been a positive force of fun at each of these. I found photos of him at CC #9, #14, #16, #17, #20 and Oshkosh. He completed his engine at #14, and test ran it with a 5th bearing at #16. At the other events he just came to help out and enjoy the company. At these events Jim saw the increasing amount of guys who were finishing 601s and flying them back to the Colleges, guys who had completed engines at Colleges right beside Jim. At some point he decided that time was getting past him a little too quickly, and it was time to switch gears and get in on the group of people who are out crisscrossing the country in Zenith 601s and 650s. I am not sure how long ago he started thinking about it, but from making up his mind to having his new plane sitting on the trailer at our place was about 21 days. He decided that he was not going to let another season get by without a serious change in strategy to make progress happen faster. Although Jim has picked up this airframe largely done, it is only 25% of his “project.” As we sat around our dining room table, we spoke of how his project is four parts: Building the engine, building the airframe, putting the two together and getting them operational, and in Jim’s case, learning how to fly. Although he has wanted to build and fly for a long time, he had other responsibilities. He is a man of action, ridden motorcycles all over the country, and experienced a lot of things. Building and flying is a just new chapter in his book. As I reminded Jim last night, learning to fly a plane with a good instructor is not a difficult task; people do it every day. Continuing to improve and hone your flight skills is what sets good pilots apart, not the initial license. I like the fact that he dove into The Arena, built the engine and got the plane, all with the confidence that he would later learn any skill he needed, including flying. There is a good lesson here for people just getting started. By my measure, picking up the airframe saved him 25% on his four-part task. Smart move in my book because the goal is to build and fly. If a purist builds every single part, he may have satisfaction, but if his goal was to fly it and the depth of detail vs. available time equation means it never gets done, then that builder didn’t get his goal. Conversely, I think Jim has a plan of action, and the accomplishment of his four-part plan is now on the horizon and getting closer. There will always be purists who claim (often from the safety of an Internet connection and a mystery email name) that it isn’t really homebuilding unless it is plans built and you grew the trees for the spar yourself or smelted the aluminum. I don’t think like that. To my perspective, “homebuilding” isn’t a competition over building aircraft, and I don’t think it is really about planes at all. I think that the real project is how the accomplishment changes the builder. How much more he knows, how much more he can make, and how he sees himself on the other end of this major challenge. The only person you’re competing with is the lesser side of your personality that would settle for you doing less with your life. That is the real enemy that you are confronting, and that is who you will defeat when you reach your goals. I look forward to hearing of Jim reaching each of his new milestones as he met the ones he has achieved already. Of the thousands of builders we have met in the past 20 years, Jim is one of the really special ones, and on the future day that I hear he has flown his plane, I will take an hour out to just simply be glad for him.